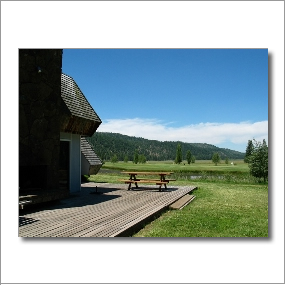 Round Lake Resort is situated among horse and cattle ranches just outside Klamath Falls, Oregon and is the ideal place to experience tranquility and peace, away from the hustle and bustle of the city. Each of the Rustic Cedar Cabins at Round Lake sleeps two people and has a bunkbed, small kitchen, shower and toilet, and living/dining room. Round Lake is also a full service RV Park and has its own beautiful 9-hole, Par 30 golf course, the most affordable in Klamath Falls! The charming rustic cabins at Round Lake Resort provide a terrific getaway destination that is sunny, spacious and offers wonderful views of the surrounding nature and mountains.